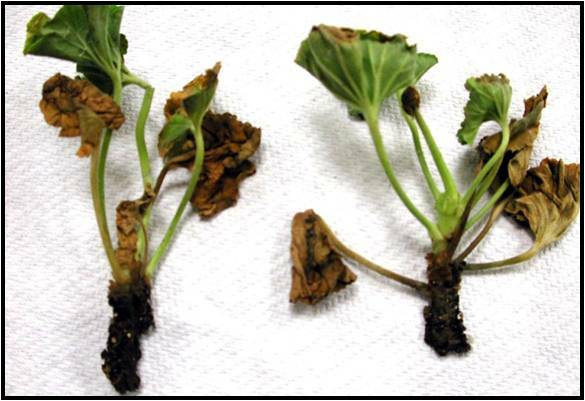 Southern Bacterial Wilt caused by Ralstonia solanacearum Race 3 Biovar2 was detected in geraniums in Massachusetts in 1999, 2003, and 2004. Growers should take precaution when encountering willted, blighted geraniums as R. solanacearum Race 3 Biovar 2 is a federally quarantined pathogen that presents risk to potato and tomato. 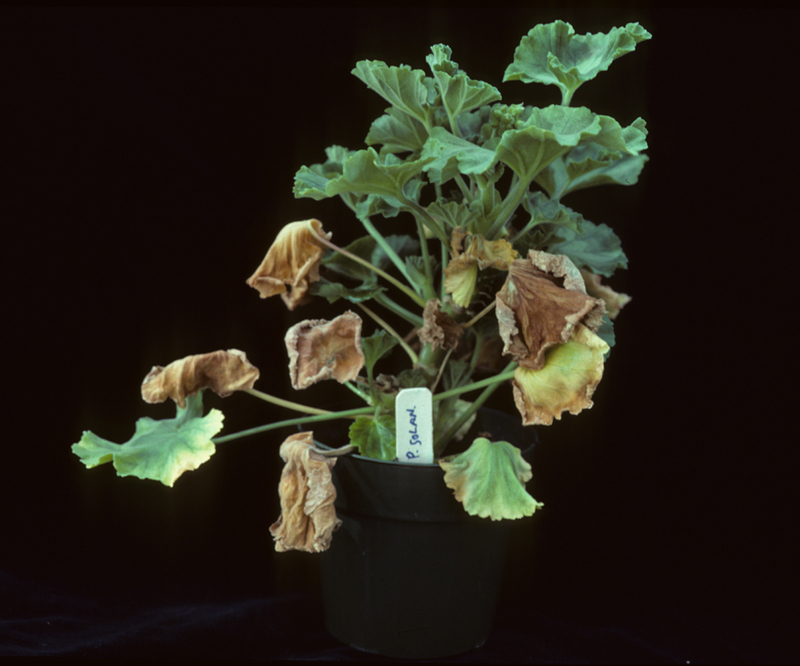 The Southern bacterial wilt disease of geraniums is caused by two races of R. solanacearum, Race 1 and Race 3. Race 1 is found in the southern United States, and has occasionally affected geraniums in greenhouses or landscapes. Race 3, however, is not found in the United States, and is therefore regulated by a federal quarantine. R. solanacearum Race 3, Biovar 2, has valuable agricultural hosts as well as a few known ornamental hosts. It is of special concern to the potato industry in the United States and Canada, because Race 3 is a cold-temperature tolerant strain that has caused serious disease problems in potato crops in other temperate countries around the world. Both races of R. solanacearum produce symptoms that are very similar to those caused by the Xanthomonas pelargonii. The main difference is that Ralstonia will cause wilting along with leaf yellowing and necrosis, whereas Xanthomonas can cause tiny, round leaf spots as well as wilt. Xanthomonas is only able to affect plants in the Geraniaceae family (including Pelargoniums and hardy geraniums). Ralstonia infects some ornamentals and vegetables within the solanaceous family. Ralstonia is spread primarily within diseased cuttings, and can be transmitted from root system to root system by water movement such as recirculating subirrigation systems. Another method of transmission is through vegetative propagation. Ralstonia is soil-borne and is not expected to spread by overhead irrigation, unless there were puddling around pot bases. Symptoms of southern bacterial wilt are difficult to detect during winter months, but as temperatures rise in the spring, they become more obvious. Growers can speed symptom development by raising the daytime temperature. For example at 81°F day temp. and 68°F nights it takes 13 days for symptoms to develop while at 75°F days and 64°F nights it takes 23 days for symptoms to develop. Since this is a regulated disease, any suspicious looking wilting plants, along with pots and soil, should be placed into sturdy garbage bags right at the bench and then held in a cool area until they can be tested. Don't carry pots with wilted plants out of the greenhouse: bring the bag to them so that potentially contaminated growing medium won't be dropped on the floor. If you suspect you have Ralstonia or Xanthomonas we recommend that you isolate any wilted geraniums, but do not discard them until a diagnosis of the cause is confirmed. For diagnosis, contact UMass Extension Plant Diagnostic Laboratory, University of Massachusetts at (413) 545-1045, If you get a confirmation for Ralstonia from the lab, then notify Lee Cortes-Real, Director of Regulatory Services, Massachusetts Department of Agricultural Resources, (617) 626-1771 and your supplier. The Director will work with the grower to follow proper procedures in order to prevent further movement. It is very important that we do everything possible to contain and eradicate this disease. Do not discard any sick geranium plants by simply putting them in the compost pile. If you have been quarantined, minimize movement of targeted plants and follow the directive in the APHIS Emergency Action Notice. Do not dump quarantined plants unless you have been cleared by USDA to do so. A USDA-APHIS official must be present to observe the dump. As part of the clean-up effort in a greenhouse where plants tested positive, use a quaternary ammonium or other labeled greenhouse disinfectant on the bench where plants were removed. Isolate new shipments of geraniums from the rest of your crops. Keep batches from different propagators separate from each other. Keep cultivars separate from each other. Keep seedlings, perennial geraniums and zonals separate from each other. Do not grow ivy baskets over seed or zonal geraniums. Work in blocks to prevent spread. Wash hands or change gloves often. Remember: Many things can cause a geranium to wilt, including Pythium root rot or high soluble salts. Don't assume that you have Ralstonia: Get an accurate laboratory diagnosis. Smith T. and Wick R. 2003. Disease alert: Southern bacterial wilt of geranium 15(5) pp 6-7.